World premieres are special occasions, and I was privileged to hear young Conrad Tao’s thrilling new piano concerto with the composer at the keyboard on March 8 at the Eissey Campus Theatre in Palm Beach Gardens, for a concert with the Atlantic Classical Orchestra. 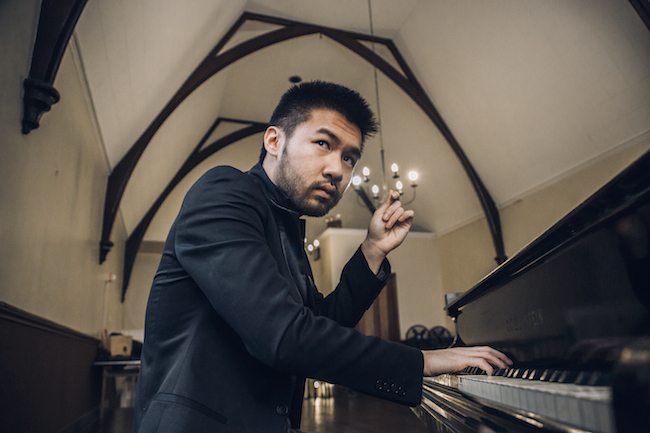 Winner of orchestra’s Rappaport Prize for Music Composition, Tao, 22, dazzled the audience with his pianistic gifts and his marvelous, scattered and unconventional musical modes. In the pre-concert talk with conductor David Amado, Tao was at pains to describe how he strived for spontaneity. Quoting Stephen Sondheim, who said “composing away from the piano often lets one know what one’s technique can do” he also pointed out that Mozart gave detailed instructions to fellow pianists who were to play his concerti, but used bare outlines for himself, often improvising the cadenzas. Calling the work The Oneiroi in New York — oneiroi are Greek gods of dreams — this piano concerto gives the nod to Tao’s love of New York City: how the gods haunt it, explore it, visit it, and live in it. Like Mozart he arrived at the concert grand with a single square-shaped sheet of music, ready to improvise. The work itself is about 20 minutes long and is filled with Tao’s curiosity about classical and popular music. There isn’t an idiom he’s missed. Jazz predominates, but only at short intervals. Tao has achieved what some might consider impossible, giving us an unpredictable, but likable, free-form concerto without the constraints of a formulaic piece. It opens full of evocative atmospherics, with cute solo work in the upper register accompanied by a marimba. The orchestra pitches in with dream-like music and some clever solo piano work that tugs away in sharp contrast. Busy New York City street music in the style of Gershwin appears, even someone whistling for a cab. Loud discordant sounds from the brass suggest gangsters being chased by cops. Lush, warm attractive piano solos follow greeted by a Chinese gong. A peaceful duet is next from the flute and piano. Mystery surrounds it with heavenly trills from the pianist. A sweet conversation follows between soloist and orchestra interrupted by the concertmaster’s violin. Speeding up the tempo, the pianist takes off in a big way suggesting a clear influence of Scriabin, with banged-out dissonant chords, thrilling runs and single notes picked out determinedly. Low-sounding trumpets and tuba interject. Cuban drumming sounds appear reminding one of Central Park where beating bongo drums are prominent Sunday afternoons, cleverly used here over long drawn out orchestral chords. Muffling the lower keys with his right forearm, Tao beats out a slow rhythmic pulse very quietly. Solo instruments play long held notes one after the other as the violins draw down on one continuous chord. The sound is eerie, dreamlike. The bassoon and thudding brass break the spell; these are the nightmare dreams of the Oneiroi: frightening music that soon dies away. The piano plays sparkling music at the top of the register continuing the eeriness in broken melodic form. A new tune emerges from the piano sounding like an early morning bird song. Skilled piano work follows accompanied by a side drum and razzmatazz trombones. The jazz idiom is in full swing for a while with extemporizing piano solos. A lone clarinet sounds its end. The music is catchy and vital. Building to the concerto’s ending, the pianist extemporizes brilliantly again. Trumpets sound a few brief notes to introduce orchestral “traffic jam” noises, recalling Gershwin once again. Throaty full out raucous chords reflect Schoenbergian drama as the orchestra ends the concerto with one glorious blast. The audience was in shock. Silence for a while until they realized what they had just heard was a terrific world premiere. And they were on their feet applauding Conrad Tao’s fine achievement. For an encore, Tao played a short Erik Satie prelude. At 22, Tao is an inventive colorful composer and solo pianist of great merit. Full of charm with a sense of fun that flows into his music, his enthusiasm for the task in hand is catching. He’s already been honored with a prestigious Avery Fisher Grant and the Gilmore Young Artists Award for most promising American pianist. He surely has a very bright future. Mendelssohn’s Fair Melusina Overture opened the program. In the spirit of a tone poem, it’s about a mermaid who desires a human husband. Finding the two disparate worlds too much to handle she returns to the underworld. The music is descriptive and has all the magic we’ve come to expect from Mendelssohn’s approach to composition. The Atlantic Classical Orchestra ended the program with Dvořák’s Ninth Symphony (in E minor, Op. 95, From the New World), which he wrote when he was director of New York’s National Conservatory of Music in 1893. Under Amado, the Atlantic Classical brought out the work’s majesty, with particularly fine playing in the third movement, with the various sections well-balanced by Amado. Standing back on the podium at the end of the concert, he surveyed his orchestra and realized what heights they’d achieved. A standing ovation followed.